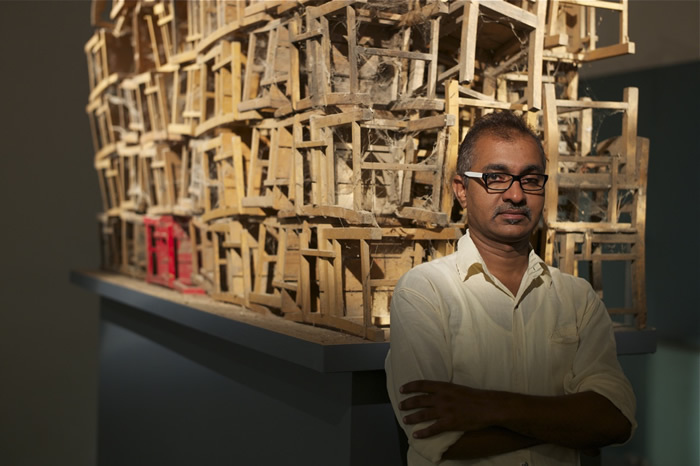 It’s the Indian political system, or the lack of it, that interests Gujarat-born artist Mansoor Ali. He uses chairs as a means of political commentary, and by changing their usual configuration, proportion and context, he opens up a dialogue of interpretations. Anatomy of an Unknown Chair is Ali’s debut solo, where in The Restless Chair, you are looking at a seat that is constantly in motion and rotates faster as you approach it; Monument to an Unknown Politician is 102-inches tall where the central column supports seven chairs of various dimensions and to reach the highest chair, you have to climb the smaller ones. The biggest chair moves in a circle, but is going nowhere. In Weight of the Political Brain, an industrial weighing scale forms the seat of an oversized chair and a miniature version of the parliament house rests on the seat. The overhead digital display reveals the weight of this political nerve center to equal that of an average human brain. It is nudging us to question the people in whom we put our faith. Mansoor Ali lives and works in Baroda and New Delhi. His works are a part of the collections at Saatchi Art Gallery. 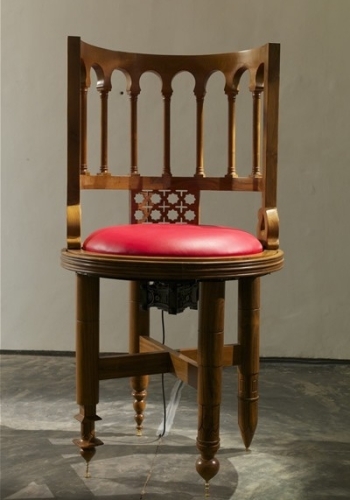 His solo show, Anatomy of an Unknown Chair, is on at Gallery Maskara, 6/7 3rd Pasta Lane, Colaba until July 31. Timings 11am to 7pm, Tuesday to Saturday.